We believe in helping people and cultivating a fairer, more just society. We strive to do this not only through our law practice but also through our personal ties to the community. When Baker, Burton & Lundy received the fees earned for work in the $1.7 billion dollar win against El Paso Gas Company, we set aside 25% of our fees to donate to charitable causes. One of the primary recipients from this fund was the organization Plant with Purpose, which reverses deforestation and poverty in the world. Albro Lundy has been involved with Plant with Purpose since 1986 and currently serves as general counsel. Other major recipients included Smile Train, Trinity College and the LA Foundation. We chose to again pledge of portion of the attorney’s fees when our team of attorneys recovered and benefited California consumers billions of dollars against Sempra Energy for unfair business practices. In this instance, the primary donation was to endow a chair for Consumer Protection at Loyola Law School. We believe that having a full-time professor specifically teaching the law of consumer protection will inspire more lawyers to defend people from unfair business practices. In addition, at the end of the settlements, partner Brad Baker presented a $93,000 cy pres donation from the natural gas settlement remainder to the Legal Aid Society of San Diego. Additionally, Baker, Burton & Lundy offers pro bono help with 501(c)(3) incorporation to local organizations. We’re proud to see groups we’ve helped like the Hermosa Beach Education Foundation still going strong twenty years later. Partner Kent Burton feels honored to have been able to help many 501(c)(3) organizations. If you have a non-profit that needs some start-up legal help, please call our offices or contact us with the form below. 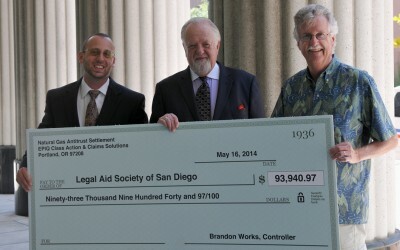 On Friday, May 16, 2014, Brad Baker, partner at the Law Offices of Baker, Burton & Lundy, presented a donation of $93,940 from the Anti-trust Natural Gas Settlement to the Legal Aid Society of San Diego, thus completing a 14 year journey. Since he moved to Palos Verdes in the mid-1990s, Torrance Memorial Medical Center has been Albro Lundy’s preferred place to donate blood. He goes in every two to three months. Mira Costa Drama Boosters, Inc.